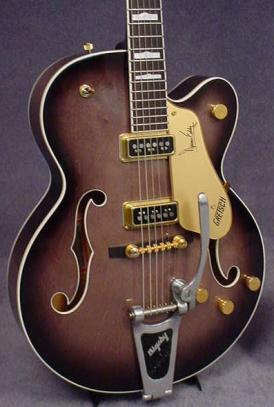 The Gretsch 6120 is the ultimate lean, mean rockabilly machine. Look no further than the recordings of Eddie Cochran, Gene Vincent, Chet Atkins (for whom the guitar was originally designed) and Brian Setzer for aural testimony of what this buxom hollowbody can do. Then, of course, there’s Duane Eddy, who, relying heavily on the 6120’s factory equipped Bigsby vibrato, more or less defined what’s come to be known as “twangy” guitar. At the early-Sixties apex of Eddy’s mainstream popularity, his film noir-like “twang” could be heard everywhere, perhaps the best example being his 1960 hit with the Henry Mancini-penned theme to the television show Peter Gunn.